These are the top 10 events relating to Lead Graffiti & letterpress that happened during 2015 in chronological order. Not a single event, but we had 155 workshop participants this year, bringing our total to 1,184. New groups included Art Conservation at the University of Delaware, Arcadia University, and James Mason University (where we also did a talk). First 2 books of our story series, “Moments Carved in Paper,” were published. The Librarian Made Us Do It (Ray’s “moment of clarity” for letterpress) and eifleS! the original idea for the series with Ray’s 2 favorite stories about his parents that started us on the project. We participated in the Manhattan Book Fair through the Fine Press Book Association. We were hoping to do enough business to pay for the booth, the drive up, a nice hotel room, and an intimate Italian dinner. Dinner ended up being Dopo East. We did 4 times that well. It is great fun telling our stories to anyone that would stop for a moment and look. We will also be doing the fair in April 2016. We may try to do the same hotel and restaurant. 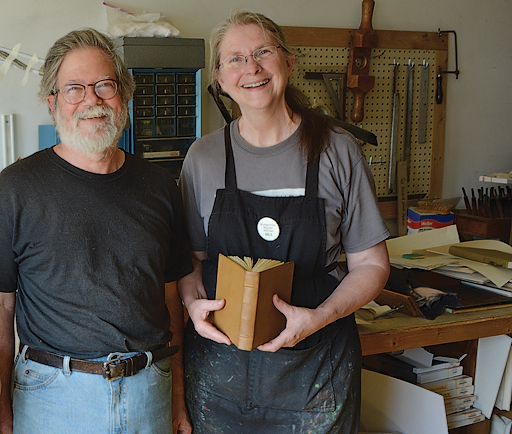 Jill took two long-desired, leather binding workshops from Don Rash. She ended up with 3 nice books. Don was the bookbinder that did the 12 leather-covered versions of our Histories of Newark: 1758 - 2008 back in 2007. He did an amazing job embedding a coin minted in 1758 with the head of King George II (he signed the charter for the city) so that you could see both sides of the coin. Don does really amazing work German style. We were invited to exhibit 35 Tour de Lead Graffiti posters from 2011 - 2014 at the AIGA / SPACE Gallery in Philadelphia. Met some great new friends and, from the opening, pulled 7 great new collaborators in for stages in our Tour de Lead Graffiti 2015. Tour de Lead Graffiti 2015 - our 5th edition of our 23 posters in 23 days while following the Tour de France. We had 35 collaborators spread over 21 of the 23 days who shared the Tour, the letterpress, and the dessert experience with us. Ray’s total time over the 23 days was 383 hours 28 minutes. There were 92 runs averaging 4 per poster, but some of them were doozies. “Endurance letterpress” at its most fun. We were invited to be the inaugural exhibition at the new gallery of the Hamilton Wood Type Museum in their new space. The 2-month exhibition included 48 of our Tour de Lead Graffiti posters from 2011 thru 2014. Special thanks to Jim Moran, director of the museum, for the invitation. I’m pretty sure Lead Graffiti got some new followers from the event. After watching it flounder along, Ray added some much-needed energy into the VC/UD - Then & Now Facebook group for former students from the Graphic and Advertising Design Group and the Visual Communications Group, 1968 to the present. Not exactly letterpress, but an important part of Ray’s life, and we’ll sneak some letterpress in every so often. 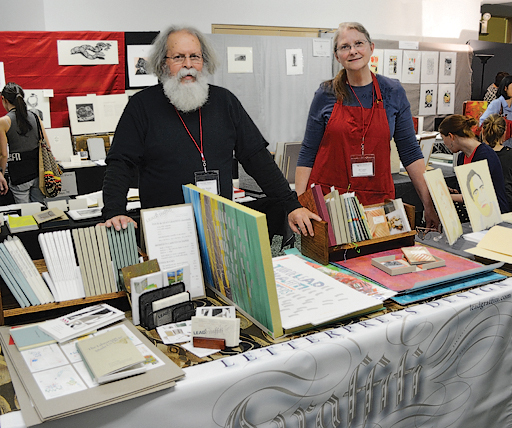 The national conference of the American Printing History Association, which both Ray & Jill attended, was focused on printing on the iron hand press. The conference injected some energy into our efforts to get our 2 iron hand presses finished. We bought one in 2007 and one in 2008 and had to have missing parts fabricated and things like bent bolts straightened or replaced. 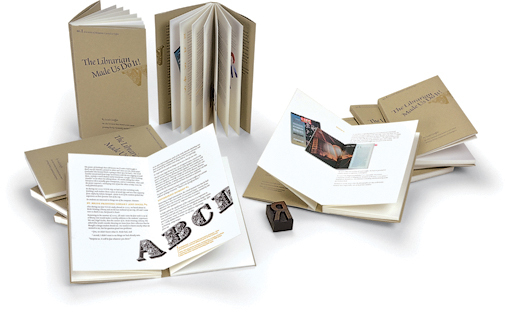 At the conference, we experienced a new letterpress workshop based on the work of H.N. Werkmen (shorter time frame, for a good number of people, and loads of colorful, typographic fun). We used the workshop for our first VC homecoming reunion in November, which we’ve been wanting to do for a while. Everyone’s kids loved it and so did the adults. This also provoked a nice iron hand press workshop run by printer Steve Heaver from Baltimore. Also, see entry T E N.
From Crooked Crow Press, Rockville, Maryland, and on extended loan, we received a full 36-line Gutenberg Bible page composed of a reissue of Gutenberg D-K metal type cast by Mike Anderson. Additionally, there are 2 job cases of the recast Gutenberg D-K type that we can use to set new pieces. We are hoping to start a new series of workshops on our iron hand presses with the type. In the process of renovating our Harrild & Sons Albion, bought from the Museum of Printing in North Andover, Massachusetts, we’ve discovered it has a significant provenance as part of the first fine press program at a major U.S. university, Carnegie Institute of Technology, back in the 1920s. One of a pair, it was purchased to print a significant 12-volume catalog for The Frick Collection. Things still seem to be happening that are very exciting to us.